Avid gardeners are busy gardeners. Sowing, planting, weeding, watering, harvesting, deadheading, composting, pest control… and the rest! But as summer moves swiftly along it’s absolutely essential to stop, sit down and drink it all in. After all, what’s the point in having a beautiful garden if you can’t take a moment to revel in its all-round gorgeousness? Here are a few ideas to help you make the most of your garden while the weather’s still clement – or ways to improve it for next summer! Make an area for relaxing in the garden where you can enjoy the results of all your hard work! If you’re going to admire your garden, you’ll need somewhere to do it from. Well-considered seating is the answer. 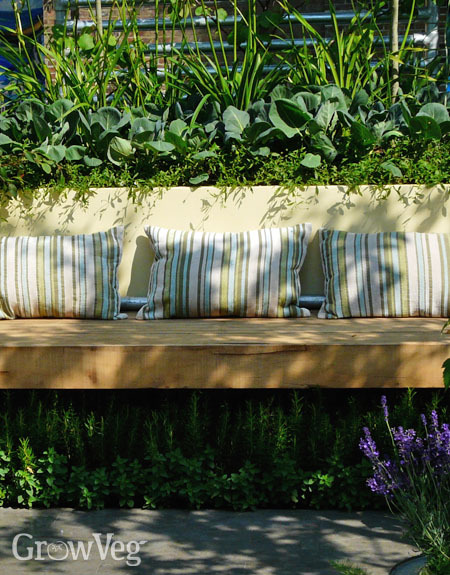 As well as the usual patio set of table and chairs, consider installing a bench in a part of the garden from where you can enjoy a good vantage point over your labours – for instance, at the end of a path looking down or across the plot, or in a cool, shady corner if you need a refuge from the heat. Consider the look and feel of the bench, which will become a feature in its own right. Permanently positioned garden seating looks fantastic when it’s visually anchored. This can be achieved by framing it with, for example, large terracotta pots bursting with bedding plants, herbs or topiary. Climbers, particularly scented climbers like jasmine, honeysuckle or rambling roses are also perfect for this purpose and may be trained up an arch positioned over the seating to offer both scent and dappled shade. Stimulate the senses with sound, colour and movement. For this, nothing beats a water feature. It doesn’t have to be grandiose; a self-contained fountain powered by a small electric pump brings the soothing gurgle of water while offering local wildlife somewhere to drink, preen and bathe. Position it somewhere you can easily hear it so it becomes a relaxing backdrop as you go about your business. Bamboo contributes a welcome rustle if you haven’t got many trees or shrubs nearby to sway and shuffle in the breeze. Choose a clump-forming variety, so it doesn’t spread through your garden like wildfire. Wind chimes give an immediate impact but consider the neighbours; wood or bamboo wind chimes are less invasive and more natural sounding than metal ones. What remains of the warmer evenings may be enhanced with a little lighting. I am no fan of the excessive glare from poorly placed spotlights or security lights. They contribute to light pollution and diminish our ability to admire nature’s light show, the stars. But a few carefully placed lights, turned on when outside, can transform a daytime garden into a nighttime wonderland. LED lighting is low cost, versatile and doesn’t use much electricity. A couple of lights directed up into the branchwork of a tree looks stunning. Good-quality strings of solar-powered fairy lights can be bought for very little outlay. Hang them around outdoor eating areas to extend your enjoyment of the garden long after the sun has dipped beneath the horizon. On hot summer days don’t forget to quench your thirst with all manner of smoothies, cordials and lemonades made from garden-grown fruits and herbs. Make the most of late summer’s abundance by seeking out imaginative recipes to turn any gluts into delicious drinks. If you’re patient, why not lay down plans for a country wine or two? Make your own flower pot beer cooler – no tools required! And how about this ingenious idea to keep your chosen tipple cool in the garden: take two clay terracotta pots, one larger than the other, then tape shut any drainage holes. Sit the smaller pot inside the larger pot, levelling up the rims by pouring sand into the base of the big pot till they are even. Then feed more sand in between the pots right up to the rims, before pouring in water to thoroughly wet the sand. Place your beers, wine or soft drinks inside, then lay a soaked towel over the top. The towel wicks moisture away from the pot, which then evaporates. This has the effect of reducing the air temperature inside to cool your drinks. It’s a great low-tech way of refrigerating drinks and somehow seems the ideal gardener-focussed solution for quenching thirst and cooling off on a hot summer’s day. Cheers!